The Multiquip QP2TH gas trash pump has a 2″ Suction, 211 GPM, 98 ft. MAX Head; Honda GX160. 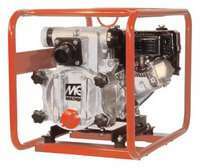 The Multiquip QP205SDPFF 2″ Salt Water High Pressure Pump with a Yanmar L70V6 Diesel engine delivers 126 GPM & 197 ft. Max Head. The Husqvarna R1420 Diagrip .165″ #587344701 is designed for use on stone, hard to medium concrete, soft concrete, and some building brick.